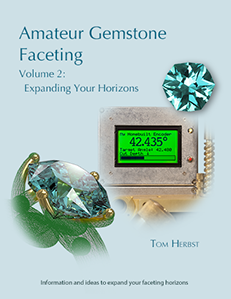 Use the links at right to order your copy of Amateur Gemstone Faceting from amazon.com. Each of the red links will bring you to the appropriate page on amazon.com to place your order for that volume. Note that Amazon currently offers free domestic shipping on orders over $35 (similar limits apply to amazon.co.uk, amazon.de, etc). Because of the way that Amazon operates, it is not easy to arrange purchase of both volumes with a single link. If you want to purchase both (and thereby get free shipping), return to this page to place the second order before paying. Alternatively, you can search for the other volume directly on Amazon, adding it to your cart before checking out. Note also that $26.95 is the suggested retail price. You will never pay more than this, but amazon.com frequently offers online discounts. 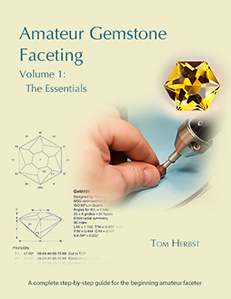 You can order Amateur Gemstone Faceting from amazon.co.uk, amazon.de, amazon.fr, amazon.it, and amazon.es. More info here.